Williamsburg Christian Academy’s faculty and staff are a dedicated, innovative team of professionals that love kids and desire to make a positive impact for the sake of Jesus. Together as a team, the WCA faculty and staff partner with parents to help all students reach their full potential. Teachers are trained in the latest techniques through a vibrant faculty development program as a way to create exciting, dynamic, interactive learning communities where minds are stretched and challenged. Faculty serves as mentors, role models, club sponsors, and coaches. Alumni often comment on how WCA teachers have impacted their lives far beyond the classrooms, even years after they leave campus. Linda Guntharp joined us in 2016 to teach K-8 Art and has taken the reins this year for Upper School Visual Arts. She holds a BFA from the University of the Arts, AAS Commercial and Computer Arts from TNCC, MBA from New York Institute of Technology and most recently an Interior Design degree from The Art Institute of Pittsburgh. Linda has worked professionally in the visual and performing arts for more than 25 years. Her teaching experiences include private lessons, studio workshops, and programs in both public and private schools. Linda’s most recent formal teaching experience was with Hampton Christian Academy where she taught 2nd through 12th-grade art and drama. Linda’s largest professional commercial accomplishment was completing over 20 murals as the lead artist on Busch Gardens ride “Escape from Pompeii”. Linda has been a volunteer and has served on the boards of York County School of the Arts and Eastern Virginia School for the Performing Arts for numerous years. She is a member of Tikvat Israel Messianic Congregation where she has previously served as drama director. Chelsea Meisinger instructs Strings, leads worship for our students in all grades. Chelsea is a native of the Hampton Roads area, having grown up in Newport News, VA. She attended Woodside High School where she participated in the orchestra and studied music theory. During her time there she performed at the Boston Pops Theatre and became Concertmaster of the orchestra. Chelsea graduated from The College of William & Mary where she completed her degrees in French & Francophone Studies and Elementary Education, with a focus in Teaching English as a Second Language. 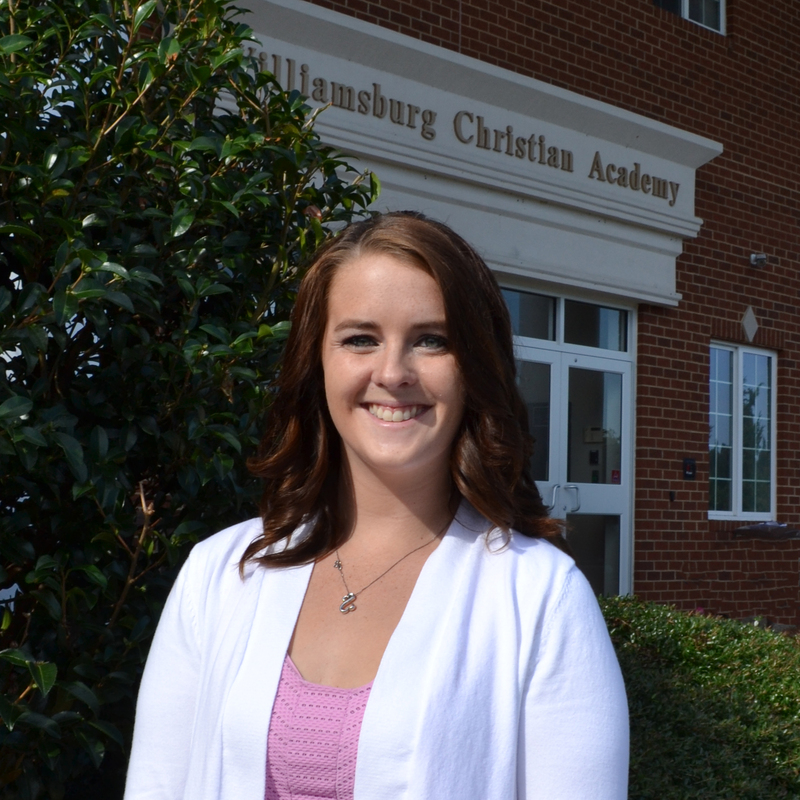 Chelsea began teaching in 2015 when she came to Williamsburg Christian Academy, after spending two years of practicum service at James River Elementary School in Williamsburg, VA. Chelsea enjoys singing, songwriting, playing instruments, leading worship, reading, and watching movies. She moved to Williamsburg in 2012 when she married her husband, David and together they have two dogs, Maggie and Izzy. They attend and volunteer at Waters Edge Church regularly, where Chelsea also leads worship periodically. Donald Vas joined the WCA faculty in 2018, and is teaching numerous high school Biblical Studies courses. Mr. Vas grew up in Zimbabwe, and attended an excellent Catholic school. After graduating High School he was blessed with the opportunity to attend college at Liberty University. It was his initial intent to return home after college, but the Lord had other plans. Donald ended up in Williamsburg, and met his beautiful wife Kiri. 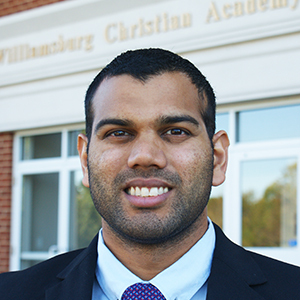 Donald serves as a youth leader at Calvary Chapel in Williamsburg, and is looking forward to the opportunity at WCA as a teacher in Biblical Studies and English in the future. Susan Rodenberg instructs the AP Literature course in our Upper School and teaches several middle school courses as well. She graduated from James Madison University with a degree in English and with minors in political science and music. She is currently working towards a Masters of Education in Curriculum and Instruction at Regent University. Susan is a state licensed teacher who has been teaching middle school English for the last few years at Berkeley Middle School. Her daughter, Emma, is a WCA alumnus and her son, Peter, is a current student. Susan is a published author and is excited to enhance student appreciation of literature and improve their writing skills! Jae Kim is the Grade 12 English Instructor. Jae graduated from Boston College with a degree in Psychology and Literature. His career started as a copy editor for a stock fund company in Korea. He has started and developed private ESL academies in Mexico, Spain, and Korea. Prior to arriving at WCA, he had been teaching in York County. Jae is excited to continue coaching girls and boys soccer. Among his hobbies are writing short stories and working on screenplays. Jae grew up as a member of James River Baptist Church but is presently looking for a permanent home church. 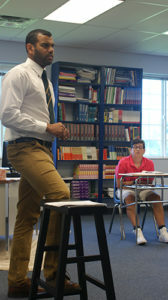 Dan Stec instructs AP Government as well as US History in the Upper School and is Faculty Advisor the Upper School Student Council Association. Dan graduated from Concordia University in Mequon, Wisconsin with a degree in Education and English and has spent over 11 years as a Christian school teacher. Dan lives in Williamsburg with his wife and their two young children. She is the worship leader at King of Glory Church where they are members. He is passionate about writing and will be developing these skills in our students. Susan Rodenberg instructs the Honors World History course in our Upper School and teaches several middle school courses as well. She graduated from James Madison University with a degree in English and with minors in political science and music. 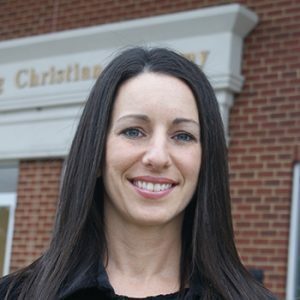 She is currently working towards a Masters of Education in Curriculum and Instruction at Regent University. Susan is a state licensed teacher who has been teaching middle school English for the last few years at Berkeley Middle School. Her daughter, Emma, is a WCA alumnus and her son, Peter, is a current student. Susan is a published author and is excited to enhance student appreciation of literature and improve their writing skills! Jae Kim is our instructor for both AP US History and AP psychology. He also fills our position as our English as a Second Language (ESL) teacher. Jae graduated from Boston College with a degree in Psychology and Literature. His career started as a copy editor for a stock fund company in Korea. He has started and developed private ESL academies in Mexico, Spain, and Korea. 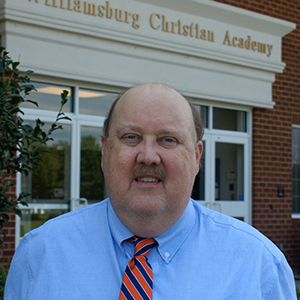 Prior to arriving at WCA, he had been teaching in York County. Jae is excited to continue coaching girls and boys soccer. Among his hobbies are writing short stories and working on screenplays. Jae grew up as a member of James River Baptist Church but is presently looking for a permanent home church. Philip Liberato is our instructor for both Pre-Calculus and AP Calculus courses. Philip graduated from Moravian College with a degree in Chemistry and a minor in Mathematics. He went on to earn a Master's degree in Chemical Engineering from The University of Virginia, as well as a Master's in Business Administration from Averett University. Early in my career, Mr. Liberato taught Chemistry and Physics as part of an exchange program with West Point High School, but moved on to a career working in the pulp and paper industry as a Technical Manager which afforded him the opportunity to travel and work around the world. Philip volunteers at his church (Our Lady of the Blessed Sacrament Catholic Church in West Point) and is also very involved with the Knights of Columbus. Mike Daly instructs Middle School Saxon math, Algebra, Geometry, Statistics, and our Personal Finance course. Mike hails from Philadelphia, PA , and earned his B.S. in Business Administration and M.A. In Teaching Math at Villanova University. 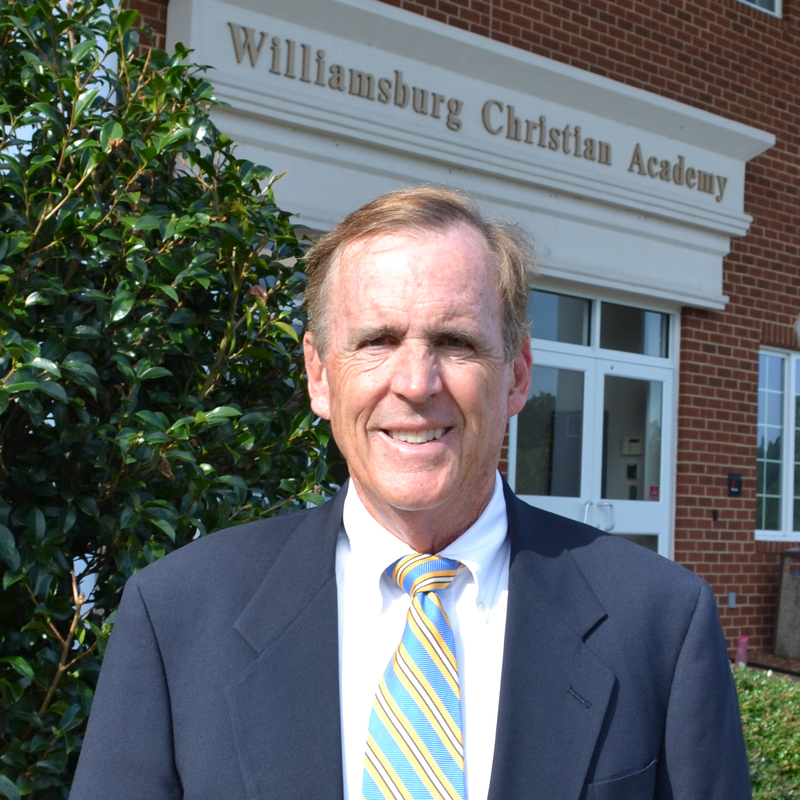 Mike has been teaching Middle and High School mathematics for over 26 years, with his most recent position at Walsingham Academy. He has been married to wife Connie, a retired Cobb County teacher, for 40 years, and they have a son Mike who is in executive leadership with the Texas Rangers organization. Mike and Connie are both avid golfers, and Mike also enjoys running (as a former Boston Marathon Qualifier), tennis and working as High School and Youth Baseball Umpire. He and Connie attend St. Bede's Church in Williamsburg. Jessica Westmoreland will instruct upper school biology and chemistry classes as well as serving as the faculty advisor to Key Club. Jessica graduated from Christopher Newport University in Newport News with a degree in Biology. After college, she moved home to Gloucester, VA and worked as a long-term substitute teacher for two years. Jessica’s prayers were answered when she received her first full-time teaching position at WCA last year, and she has become a vital asset to WCA's Science department these past two years. Mrs. Westmoreland encourages our students to enjoy science through extensive hands-on learning and laboratory exercises. Jessica married her husband, Josh in June 2016, and they are the proud “parents” of two Great Danes. When she isn’t playing with their dogs, Jessica and Josh enjoy reading and spending time outdoors. The newlyweds attend Liberty Baptist Church. Philip Liberato is new to WCA this year is our instructor for AP Physics and our Chemistry courses. Philip graduated from Moravian College with a degree in Chemistry and a minor in Mathematics. He went on to earn a Master's degree in Chemical Engineering from The University of Virginia, as well as a Master's in Business Administration from Averett University. Early in my career, Mr. Liberato taught Chemistry and Physics as part of an exchange program with West Point High School, but moved on to a career working in the pulp and paper industry as a Technical Manager which afforded him the opportunity to travel and work around the world. Philip volunteers at his church (Our Lady of the Blessed Sacrament Catholic Church in West Point) and is also very involved with the Knights of Columbus. Maria Torchik is our Spanish Instructor or Spanish I, II, and III, and with hopes of expanding the program to Spanish IV next year. Maria was born and raised in Bogota, Colombia. She has a B.A. in Spanish from the College of William and Mary, a B.F.A from Bellevue University (Nebraska), and a Master's in the Arts in Museum Education from William and Mary as well. She has been teaching in the United States as well as abroad (Colombia, Saudi Arabia) for over 30 years. She is happily married to her husband George of 47 years and has a terrific son Ayen and two awesome granddaughters, Anastasia and Tatiana. She loves to read, paint and travel. The Torchik's attend St. Olaf's church in Norge. Beth Fletcher, our Middle and Upper School Principal, graduated from American University in 1989 with a B.A. in Psychology and earned her Masters of Social Work specializing in Disabilities in 1991 from Gallaudet University, also in Washington D.C. As Gallaudet is the premier university in the world for deaf people, as all of the classes are taught in American Sign Language and provided a truly unique opportunity for Beth to experience this very special culture and language. With this extensive knowledge, Beth also contributes to teaching our course in introductory American Sign Language. Crystal joined the faculty of WCA in 2018. She is our lower school enrichment specialist, she also teaches the initial American Sign Language course. Crystal graduated from Old Dominion Univertsity in 1998 with a Bachelor's Degree in Speech Pathology, with a minor in Special Education. Crystal realized her passion was in special education and began teaching in the public school while she was working on her master's degree in special education from ODU. She left teaching after a few years to stay home and raise her family. Crystal returned to school last spring to finish up her master's degree at ODU and return to the field that she loves! She lives on a historical farm in Charles City with her husband and five children, three of whom currently attend WCA.